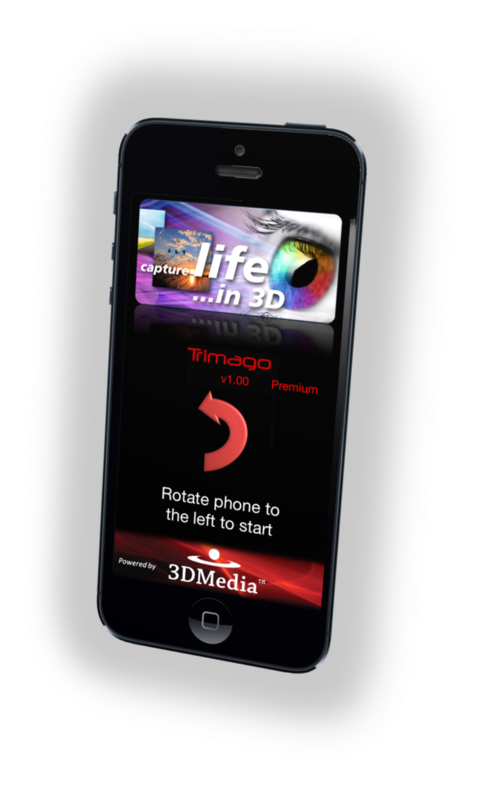 Trimago is a smartphone application that allows you to capture and create amazing 3D photos. It is part of 3DMedia’s integrated solutions that allow users to easily capture, share, and enjoy their personal 3D content. STEP 1: Point phone at the subject and take the first photo while holding the phone steady. An overlay of an image from a different position will be shown on the screen. STEP 2: Slowly move the phone to the right until the overlay guide image aligns with live view image. The second photo should be taken automatically when the phone is in the proper position. Capturing of the second photo automatically triggers the 3D creation process that will generate a 3D photo. STEP 3: Once the 3D photo has been created, you can either save it or upload it to the 3D Gallery (3dmediagallery.com). When you upload a photo to the 3D Gallery, it is automatically saved to your standard photos folder. You can then enjoy your 3D photos using a Smart 3D HDTV or any other suitable display. To facilitate this connectivity, 3DMedia has developed the 3D Gallery Connect Smart TV application that runs on selected 3D HDTVs and allows you to access your personal 3D photos, as well as other high-quality 3D content created by 3D professional photographers. Trimago allows you to share your 3D photos or keep them private. You can also manage your 3D photos and albums using an internet browser on any connected device by visiting 3dmediagallery.com. Your account is the same as the one you created on the smartphone. · Do not try to create 3D photos of moving objects. Trimago does not currently have the ability to compensate for movement of objects that occurs between taking the two photos. Trimago enables you to create 3D self-portraits using smartphones with secondary face cameras. To ensure the proper 3D experience, this capability is limited to smartphones that have good quality secondary cameras. You can use the camera switch button to alternate between normal and self-portrait 3D capture mode. Please note that in 3D self-portrait mode the automatic capture mode is disabled and you need to take the second photo manually by pressing the photo TAKE button. Also, please make sure that your face stays still and does not turn while you are moving the phone. · New Upload: Using this mode, you have full control of the upload process. You can create new albums, select existing albums to upload the newly created 3D photos, change accounts, create private albums, and set photo tags. This mode should be used the first time you upload a new set of 3D photos to the Gallery. · Upload: This is single tap upload button that uploads the newly created 3D photo to the gallery using the same account and album as the previous upload (the photo tag will auto-increment. This is a quick and easy way to upload related 3D photos. By clicking the Album button you enter Trimago's Photoviewer that allows you to view and upload 3D photos to the Gallery. The Photoviewer has the thumbnail view and the single-photo view mode. You can enter the single-photo view mode by tapping the corresponding thumbnail. From that mode, you can upload the displayed photo using either the upload buttons. Trimago's photoviewer detects all 3D photos in the standard photo library and presents them to the user in the selected 3D viewing format. Note that all 3D photos are also stored in the standard photo library. Some smartphones, such as Apple's iPhones, do not allow apps to delete photos from this library. Therefore you can delete your 3D photos only by using the smartphone’s standard photo viewer. Also, note that on iOS7 the 3D photos may be stored under the Panoramas category on the standard photo library. · Viewing: You can scroll up/down to see the captured 3D photos in thumbnail view. By tapping a thumbnail you enter the single-photo view. You can move to the next or previous photo by swiping your finger left or right. By pressing the Upload or Repeat Upload buttons you can upload the displayed photo to the 3D Gallery. · Bulk Upload: In thumbnail mode, you can press the Select Images button to select multiple photos. Tap on a thumbnail to select a photo. Tap on a thumbnail again to deselect the photo. Press the Upload button to upload all selected photos to the Gallery. Trimago has the ability to read location information from the smartphone and embed it in the headers of the 3D photo. The button on the upper left corner of the phone indicates whether the location services are enabled or disabled. If they are enabled, you can tap the red pin icon to update and see the current location on the screen. When enabled, the location is updated automatically when a photo is taken. To enable location services in your iPhone, go to 'Settings -> General -> Restrictions -> Location Services' and set BOTH 'Location Services' to ON and 'Trimago' to ON (this may vary based on the version of the operating system version). At the lower left part of the screen, a label that shows the number of photos that are left to capture/upload under your existing subscription service. This label is blank for subscriptions that allow you to capture and create an unlimited number of photos. Below this label, there is another label that shows the resolution of the 3D photo that will be created (720p represents 1280x720 resolution, 1080p represents 1920x1080 resolution, and Full is the maximum resolution supported by the smartphone). Trimago offers in-app purchase capabilities that allow you to easily buy new products or services from the smartphone’s supplier store. Trimago connects to the smartphone’s store and provides you with the various product/service options. The top part provides you information about the subscription you currently have. Below is a scrollable list of the available services, including a brief description, price, and main features of each service. At the bottom of the list there is a more detailed description of the product/service. Once you decide to purchase a subscription to a service, you can click on the BUY icon. An auto-renewal subscription may be available for the selected service at a discounted price. If such service is available you will be presented with the different options. Once you complete a purchase, Trimago will notify the servers on the 3D Gallery about your new level of service and all information on Trimago will be updated accordingly. In case you accidentally delete the app, you can restore your service by logging in to your account form the Options => Register/Login/Restore button. All purchases will be handled directly utilizing the smartphones store. You do not have to supply any purchasing information to Trimago. · In automatic mode, you take the first picture and then you move the phone slowly to the right side until the live image is overlaid on top of the guide image. The second picture will be taken automatically. This is the default setting for ease of use. In rare occasions when the second picture is not taken automatically, you can press the TAKE button again to take the second photo when the phone is at the target position. · In Manual mode, both left and right pictures must be taken manually. This can be useful if you want to create a 3D photo with a non-standard depth profile. In this case the guide window shows how far you are from the original position and there is no feedback on how far you are from the ideal settings. If you take the second photo at a distance less than the one recommended in automatic mode, the depth of the 3D photo will be compressed, which could make it more comfortable to enjoy at the expense of a less dramatic 3D experience. If you take the second photo at a distance greater than the recommended one, you will increase the depth of the photo. WARNING: Increasing the distance between the two photos too much may create a 3D photo that is difficult to see and enjoy. Depth Adjustment: This bar controls the depth effect of the 3D photo and is applicable only in automatic mode. Higher values will create more depth compared to the default settings. Lower values will create less depth compared to the default settings (default value is at the center position 0). · 1280x720 (i.e., 720p) resolution: This resolution requires the least amount of storage space and it is faster to upload. · 1920x1080 (i.e., 1080p) resolution: Most 3D HDTVs currently support 1920x1080 resolution (i.e., 1080p), however they may not display 3D photos at that resolution. · Full resolution: The full resolution setting allows 3D creation at the full capture resolution of the smartphone. In full resolution, photos displayed on 3D HDTVs probably will not fill the entire screen; instead there will be empty borders on the left and right sides. This is because most smartphones use image sensors that do use a 16:9 aspect ratio that matches an HDTV display. Full resolution photos can be cropped with other tools (e.g., 3DMedia’s 3DComposer available at 3dmedia.com) to create a 16:9 aspect ratio. Display apps capable of supporting zoom and pan-scan can take advantage of full resolution photos. · Overlay: This is NOT a 3D viewing mode. In this mode, the left and right images are superimposed in top of each other. It provides a similar effect to watching 3D content on a 3D HDTV without 3D glasses. · Anaglyph: This IS a 3D viewing mode. In this mode, you can see the 3D effect using anaglyph red/blue glasses. · Side-by-Side: This is NOT a 3D viewing mode. It shows the left and right images side-by-side. You can register to use the 3D Gallery by clicking the Option button and then the registration button. To register and upload 3D photos you need to select a login name, a valid email address, and a password. If you have already an account, then you should turn off the New Account switch and specify your User Name and Password. By logging in to your account, any services that you have purchased from 3DMedia will be automatically stored in the Trimago app. Also, in case you accidentally deleted the app or you replace your phone, you can restore your purchased services by logging into your account.